nmth Partners. The gentlemen draw the ladies toward them and then pass the ladies behind them by the left hand, at the same time pivoting to face their Corner Ladies in the ring of four. Left hands are released and right hands are taken ivith Corners. The gentlemen draw the ladies toward them and then pass the ladies behind them by the right hand, at the same time pivoting to face their Farmers. Right hands are released and left hands taken with Partners, the gentlemen placing their right hands at the ladies' backs and wheeling the ladies counterclockwise to home place. This is the Western Do-si-do. All now Promenade with Partners once around the set. 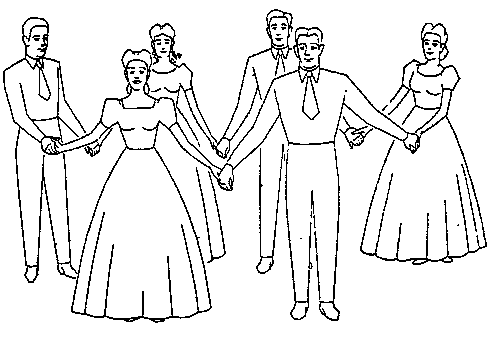 The call is repeated with the Second, Third, and Fourth Couples in turn leading the dance.